by marc / Friday, 21 August 2015 / Blog Category: Everything Vegas. Fremont Street will have a very different vibe beginning sometime next year. Last week one of the quieter casinos in Downtown Las Vegas was sold to the owners of two of the more bustling casinos downtown. The Las Vegas Club was sold by owners The Tamares Group and operators PlayLV to Derek and Greg Stevens the owners of The D and Golden Gate Hotel & Casino. Las Vegas Club is one of the oldest casinos in Las Vegas. It opened in 1930 and installed the first neon sign outside of a casino-hotel in 1931. This was only the second neon casino sign in the Las Vegas. The Las Vegas Club used to be on south side of Fremont Street and moved across the street in 1949 to the property formerly known as the Overland Hotel. The Las Vegas Club then expanded to its present location at the corner of Fremont and Main. In 2002 owner Jackie Gaughan agreed to sell the Las Vegas Club and three other casinos, including the Plaza and Gold Spike (then a casino) to Barrick Gaming which had a partnership with The Tamares Group. The Las Vegas Club has been on a slow downward spiral for more than a few years now. The Las Vegas Club was a sports themed hotel and casino but back in 2000 they closed the sports book. The sports themed property losing sports wagering was just the beginning of the end. Over the next 15 years restaurants closed, a poker room opened and closed and the last straw seemed to be the closure of their 400 hotel rooms two years ago. Over the past few years the Las Vegas Club has been a part of many rumors including hotel renovations, hotel conversion to luxury condominiums and even opening a CVS on part of the property while some space remained a casino. None of those rumors ever saw the light of day. Those rumors are erased as the Las Vegas Club is closed. The future of the hotel and casino that was formerly known as Las Vegas Club will be something different. 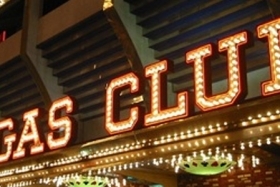 The sale of Las Vegas Club was specifically for the real estate and the building. The Stevens brothers did not buy the name of the property, the customer database or any of the gaming equipment. The new property will have a new name and will probably share a similar fun vibe that you can find at The D and Golden Gate. Shortly after being sold the Las Vegas Club closed its doors and will be evaluated for the future. A new name is certain and a theme, restaurants, bars, hotel rooms and construction are still to be determined. Derek Stevens says that will be revealed later this year. If you were a fan of the games or people who recently worked at Las Vegas Club you should be able to find them across the street at the Plaza.